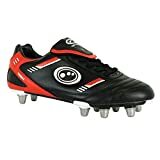 Among the popular Rugby boot brands, you will find Canterbury enjoying a good reputation so you might want to consider going for Canterbury Rugby boots for something useful and reliable that you could count on for efficient sporting. PU Upper - Provides protection and support to your feet. Cushioned Collar - Adds comfort. PowerLast - Reduces lower limb strain and promotes a power positioning. Stud Outsole - Creates grip and traction on soft ground. Soft Ground Studs - Ideal for winter conditions. PU Upper - Provides a cleaner, more robust feel. Canterbury Speed Last - Offers a wider forefoot and locked in toebox. 8mm Heel - Reduces lower limb strain. 6 Stud Outsole - Ensures traction on soft ground. PU Upper - Maximises comfort and durability. Wide Foot Base - Helps to keep the foot secure. 8mm Raised Heel Box - Limits the strain on lower limbs. Detachable Studs - Ensures traction and agility. Soft Ground - Ideal for wet, difficult conditions. Slim fit for dynamic fit. 8mm heel raise reduces lower limb strain and provides optimal running stance.